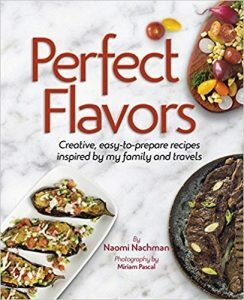 Once again, the “Aussie Gourmet” takes kosher cuisine to the next level with her latest cookbook, Perfect Flavors. Complete with stunning photos to accompany each recipe, you’ll find many incredible options that are sure to grace you dinner table. Below please find a couple mouth-watering sample recipes. 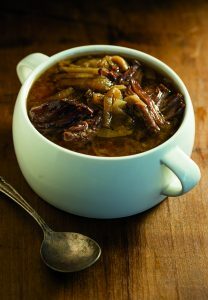 Who doesn’t love a big bowl of onion soup? However, making it can be time-consuming, as you have to sauté the onions for a long time while stirring them. This recipe allows you to skip the sautéing, as your crock pot does all the work for you. 1. Combine onions, salt, pepper, and oil in a crockpot; stir to combine. 2. Add flanken to the crockpot; cover with onion mixture. Cover; cook on high for 4-5 hours, until onions are golden brown. 3. Add broth, wine, and miso paste; stir to combine. Cook on high for an additional hour. Thanksgiving has always had a special meaning to me. I came to America on Thanksgiving and met my husband exactly a year later on Thanksgiving. 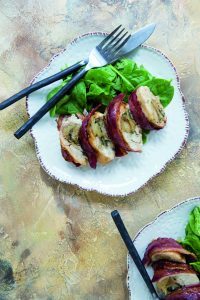 This recipe is a twist on a turducken, which is a deboned chicken stuffed into a deboned duck, stuffed into a deboned turkey, with layers of stuffing between each bird. This is a dark meat chicken capon stuffed with turkey and wrapped in duck fry. It’s a whole new take on turkey. 4. Prepare the stuffing: Heat oil over medium heat in a large frying pan. Add onion; sauté, stirring occasionally, until translucent, 5-7 minutes. 5. Add garlic and spinach; cook for an additional 5 minutes. Add bread cubes; cook for 1-2 minutes. Remove from heat. 6. Add turkey, salt, thyme, chili powder, and maple syrup to the spinach mixture. Stir until combined. 7. Assemble the capons: Preheat oven to 350°F. 9. Sprinkle salt, paprika, and onion powder over the tops of the capons, then drape duck fry over each one. 10. Combine maple syrup and balsamic vinegar; brush mixture over the top of each capon, reserving some of the mixture for Step 8. 11. Cover tightly; bake for 1 hour. Uncover, brush again with maple syrup mixture, and bake for an additional 10 minutes, uncovered. Slice and serve. For a unique side dish, bake any remaining stuffing in muffin tins at 350°F for 30 minutes.